Several pieces of framed art and hung posters are currently up at Revolution 9, many of which are currently for sale from $40-$50. Shirts and hoodies with many different designs are also available in varying sizes ranging from $25-$30. A New Welcome to Rev9! If you haven't stopped by the store lately, you're in for a surprise! Artist and Rev9 family member Amin Al-Jamal has graced our entryway with a new welcome--our very own Lovecraft-inspired Shoggath to invite you inside. Earlier this month, Sir Francis Drake Highschool's AP Art class dropped off some wonderful pieces from aspiring young artists! Student Artist of the Month: Amin Al-Jamal! Visit the shop to see the rest of the gallery! Or, visit the student artist page to see a few more works. Either way, a jolly parade of smiling creatures awaits you. Annual Revolution 9 Haunted Back Room! In which Lord and Lady Downton present artifacts procured on their recent trip to Egypt. Drop off your original art by September 30th to be included in our annual Halloween art show! Anything spooky goes! Sir Francis Drake High School's R.O.C.K. (revolution of core knowledge) Art Installation pays a visit to R9! Inspired by artist Ik-Joong Kang, whose tile installation at San Francisco International Airport impressed Huda enough to suggest doing the project, and offer Rev9 for the installation, and even deliver all these 3"x 3" tiles. Each of the nine "flocks" of about thirteen students chose one complementary color pair to use on their tiles. Students collected many of one household item which is typically discarded, and made a sculpture that could exist in a futuristic world that we may use next year in Drama. "Chloe Sotnick has been drawing for as long as she can remember. It began with crayon stick figures and it evolved into detailed graphite drawings. At Drake High School she rediscovered her passion for art and became serious about working towards a creative career. This led her to leave traditional high school to be home schooled and have the freedom to actively pursue careers in the arts, both 2 dimensional and performing. She currently resides in Fairfax where she spends most of her time drawing and training as an acrobatic contortionist and aerialist. She strives to one day become both a professional artist and circus performer." Visit Us at the Edwardian Ball! Revolution 9 will be having a booth at the Edwardian Ball again this year--please come by and say hello! We are also selling tickets for this most wonderful event. Have you seen the Totoro art show? There are only a few days left to see the kid's Totoro Art Show at Revolution 9! More than two dozen Totoro-inspired art pieces are up for display, all created by local k-8 fans of the beloved children's film! Stop in before December 31st to catch a peek before the students take their art home. Whovians prepare! On Saturday November 23rd at 7pm we will be hosting our very own Doctor Who party for the 50th anniversary! There will be costume contests, trivia, prizes, food, and of course Doctor Who showing!!! We will be airing the 50th anniversary episode at 8pm in our very own Rev9 lounge! So come one, come all for our free Doctor Who anniversary party! November 23rd 7pm-9ish-pm, with anniversary episode showing at 8pm! Meet the new members of the R9 crew! 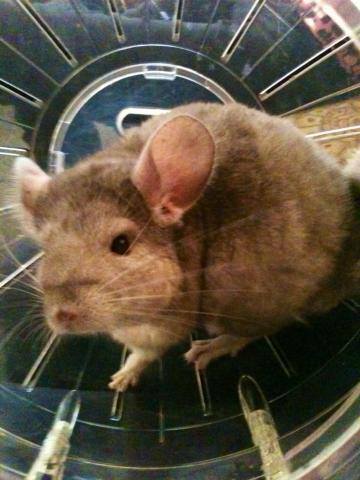 Chibi the chinchilla, and our cute baby tortoise! A delicious breakfast of spinach for the baby tortoise. Mmmm spinach. Know an artist in grade k-8 who loves TOTORO? 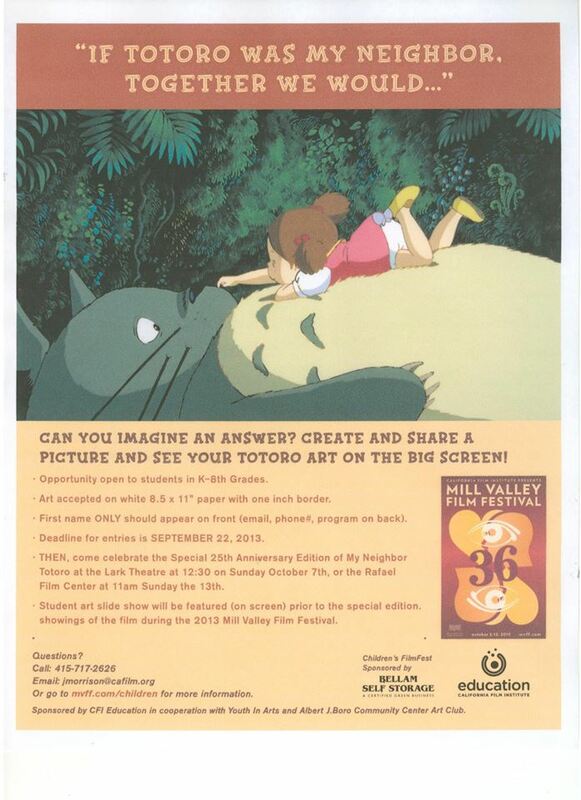 This is a fun opportunity for their art to be on the big screen during the 25th anniversary showing of Totoro at the Mill Valley film festival. Then, in December the art will be shown in the Revolution 9 gallery!